A scholar’s rock is usually a naturally formed stone. It can be of any colour and size. Such stones were used to adorn a scholar’s desk in his studio and represented mountains, while acting as indoor versions of the magnificent natural stones that were installed in gardens and palaces. In the Tang dynasty (AD 618–907), a set of four principal aesthetic qualities for the rocks were developed: thinness, openness, perforations, and wrinkling. 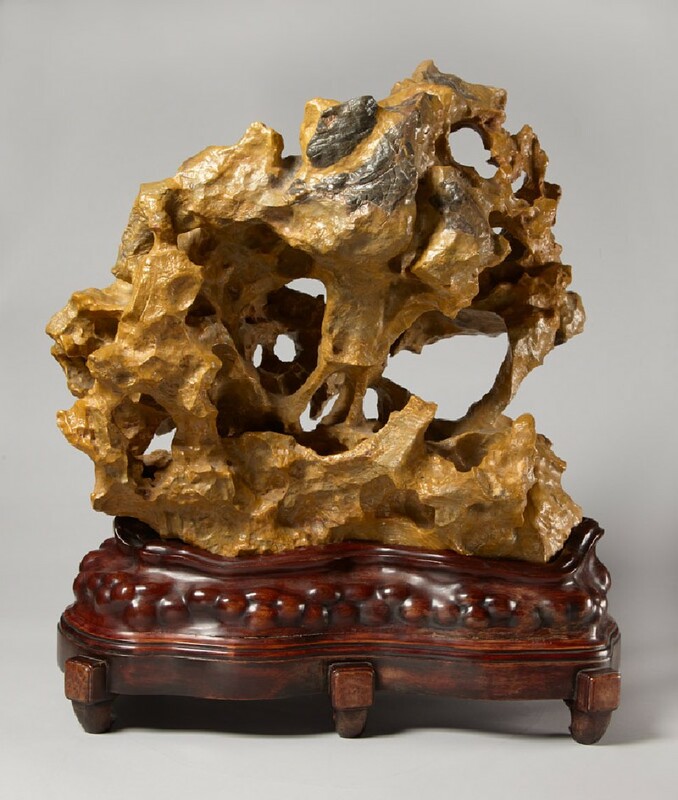 Among the four major stone formations of scholar’s rocks in China, ‘yellow wax’ rocks come from the Lingnan region of China and are mainly composed of andesite with silica, therefore they are as hard as jade. The term ‘yellow wax’ may derive from their purity of colour and the glossy surface. Its golden caramel colour and natural perforated form rank this rock among the finest of this type. Inscriptions on the back of the rock suggest that it may once have belonged to the Chinese collector Xu Shizhang (1889-1954).